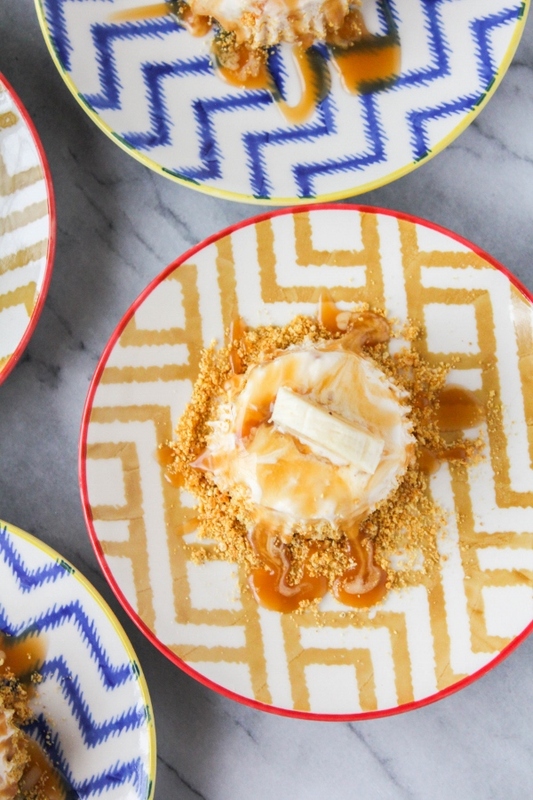 These five ingredient Bananas Foster Ice Cream Tartlets are just as delicious as they are adorable! They make a perfect dessert for birthdays, holidays, or any other special occasions. Happy April, friends! It was somewhat warm here this weekend with lots of sunshine and it definitely got me into the spring spirit. I dusted off my grill and got my table and chairs ready to go on the deck. I shopped at the local farmers market and picked up tons of fresh produce. Over the weekend I enjoyed heirloom tomatoes, zucchini and yellow squash. Can you tell I'm really ready for warm weather?? Speaking of warm weather, my friends at Hudsonville Ice Cream sent me three of their brand new flavors to try out before they hit stores. You know how much I love ice cream and these new flavors are out of this world! I can't wait for you to give them a try. The new flavors are Bananas Foster, Peanut Butter Cheesecake and Peanut Butter Pretzel. Mouthwatering, amiright? The new flavors will be in stores later this spring. My mom's birthday is coming up and I wanted to create a special dessert for her, and I knew one of the new Hudsonville Ice Cream flavors would be part of that dessert. So what did I come up with? 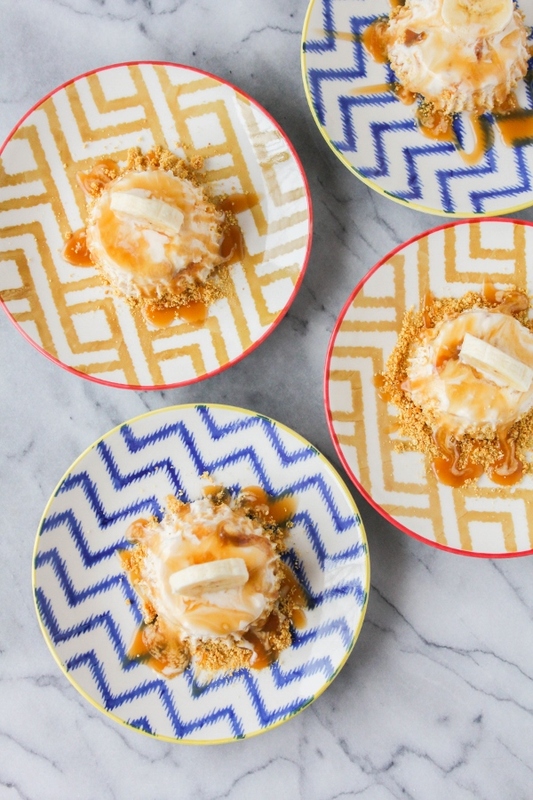 These incredible Bananas Foster Ice Cream Tartlets, that's what! This dessert is simple to make and is the perfect portion to enjoy after a big meal. I've always loved Hudsonville Ice Cream. Made in West Michigan, they've been around since 1926 and have over 50 delicious flavors. Their blue-label all season flavors can be found all year round. Their red-label is reserved for limited-edition flavors. They also have the green-label NATURALS™ line that uses all-natural ingredients. Their base recipe starts with locally sourced milk, cream, and sugar, and hasn't changed in over 90 years! To me, this is the best tasting ice cream around. The Bananas Foster ice cream is banana flavored ice cream with a caramelized banana ribbon and vanilla wafers throughout. I love getting a spoonful of banana pieces and caramel all in one bite! 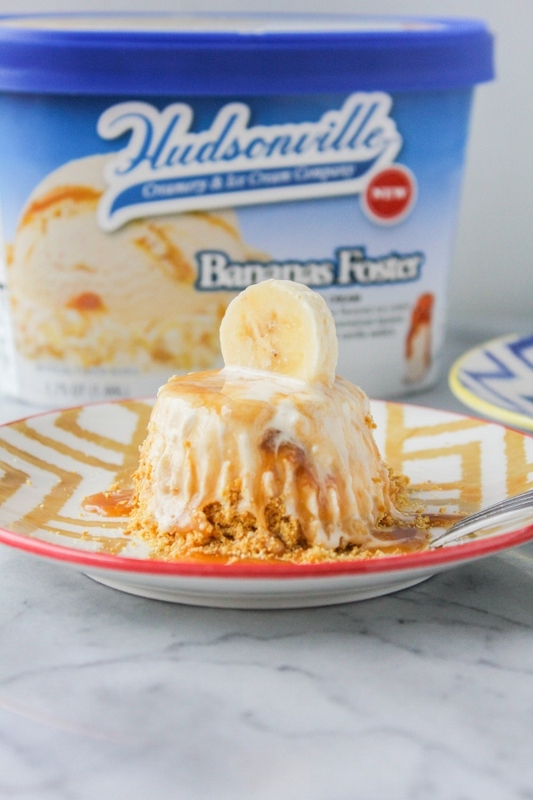 For my Bananas Foster Ice Cream Tartlets I created a simple graham cracker crust that pairs perfectly with the ice cream. 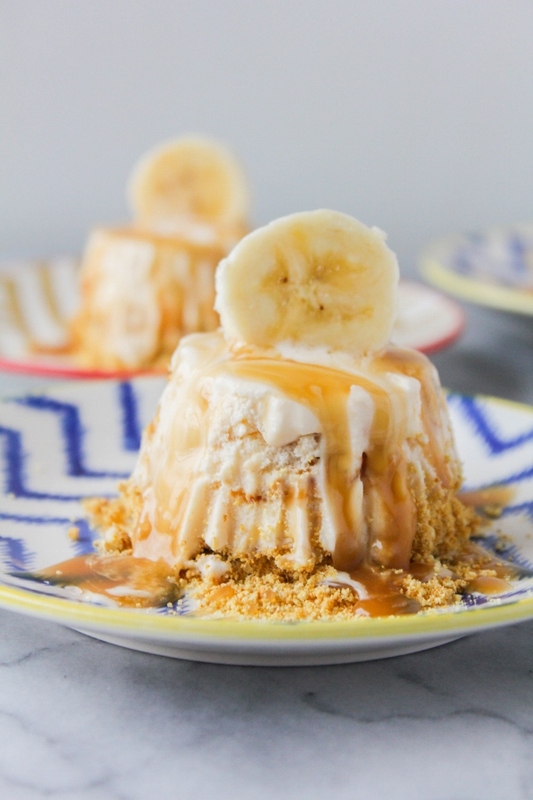 Topped with caramel syrup and a fresh banana slice, it's the perfect dessert for kids and adults alike! In a small bowl mix together the graham crackers crumbs and butter. Place paper liners in a 12-cup muffin tin. Scoop about 1/4 cup of the ice cream into each of the wells in the pan. Top each with a heaping tablespoon of the crumb mixture, pressing gently into the ice cream. Freeze for 3 hours, or until firm. Remove the tartlets from the pan and discard the paper liners. Place the tartlets, crumb side down, on plates. Drizzle each one with caramel sauce and top with a banana slice.